It's a fact. Good people sometimes have bad credit. And financing a new or used car with a poor credit history or low credit score is often a frustrating and humiliating experience. Until now. 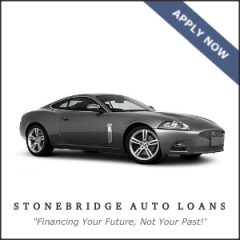 At Stonebridge Auto Loans, we place bad credit car loans, new car loans, used car loans, car loan refinancing, and car lease buyout financing exclusively for people with no credit, or bad credit due to late payments, collection accounts, vehicle repossession or bankruptcy. Applying through our service is free, getting approved is easy, and by offering a fast - completely secure - online application process, specifically designed with your convenience and privacy in mind, we ensure your experience will be trouble free. Because you are approved to purchase the new or used car, truck or sport utility vehicle of your choice, our Dealer Purchase Loan is easily the best bad credit car loan program being offered today. Once approved - you'll be given a credit limit - so you can negotiate like a cash buyer - ensuring that you get the best price! You can now buy the car in your neighbor's driveway or from the classifieds with a Private Party Purchase Loan! Our Private Party Purchase Loan offers you the flexibility to purchase your vehicle from any individual whether they still owe money on it or not. Love your car, but hate your payment? Then auto loan refinancing is for you. When you refinance your existing car loan, you can lower your interest rate, which results in lower payments. You may also be able to lengthen the term of your loan, which will lower your payments further. And in most cases you will be able to skip up to 3 payments! Your credit isn't perfect? No problem! You may still be eligible to refinance your car, saving you money, paying off your car early, or lowering your payments. Why would you consider a buyout of your existing car lease? Because you know the history and condition of your car, so it makes a great used car purchase without the uncertainties of buying from a dealer or a stranger. And if you have exceeded the mileage on your lease and have to pay for excessive mileage or damages, you can avoid penalties by buying out the lease. APPLY IN MINUTES - ANSWER IN SECONDS! Have questions? Please visit our FAQ. "I have never had such a pleasant experience purchasing a car. They were most courteous and professional. I will return in five years! Thank you for making it painless, pleasant and most of all hassle free!"